Apple has introduced another way to add events to your calendars in iOS. 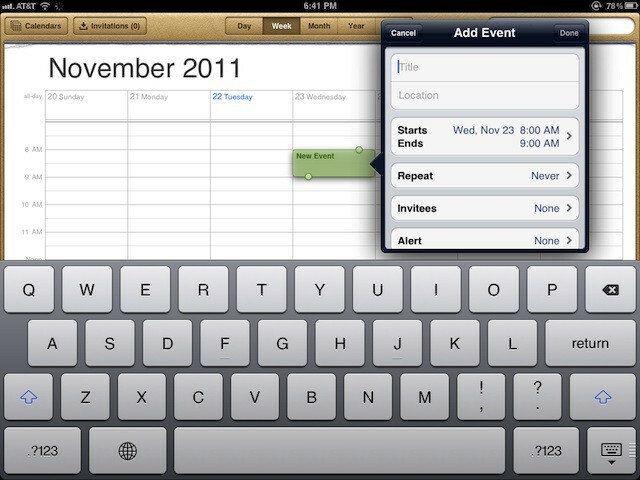 You can quickly and easily start the process to add an event to any of your iOS calendars with only one finger! Open up the Calendar app on your iPhone, iPod touch or iPad. You can add an event to the calendar the old-fashioned and most obvious way by tapping the + symbol, but it is easier to do it with only one finger. Just tap and hold with one finger on the calendar where there isn’t an event currently scheduled. The calendar app will oblige you by opening a new event ready for you to enter the details about. The advantage of using this method over tapping the + symbol is the event will have the date, start and end times entered for you. The default is one hour which you can adjust in the pop-up that appears. I don’t now about you, but I’ll be using this tip to enter my calendar events from now on.